You are currently browsing the category archive for the ‘Robertson Workshops’ category. I enjoyed a great party last night at the 24th annual Cascade AIDS Project Art Auction in support of the fight against HIV/AIDS. CAP’s Art Auction is the social event of the year in Portland. There was great food, wine, music, dancing, and art. Some 250 artworks were juried into the live and silent auctions, including one of my paintings pictured here, called Watching Light Leave. Here are some photos from the event. Enjoy! Carolyn Butters, Andrea Schwartz-Feit (with her painting lower left) and Kris Butters of Butters Gallery are always fun to hang with. Easily the funniest event of the night was when I saw some crazy woman running her hands all over Janet Amundson Splidsboel’s beautiful encaustic painting. Up went my hackles and I stormed over ready to tackle her! I got there about the same time as security only to discover it was the artist herself, buffing her painting with the palm of her hand. In the bright light she had noticed a spot on the surface that was driving her nuts. We all had a good laugh and I told Janet it was a great publicity stunt. She suggested to the security guard that they meet up and do it again later. Well done! I had a similar experience once too. I once sold a painting while fixing a chip that went unnoticed until the opening. The gallery set me up for an impromptu demo as I was fixing the work and it sold before the wax was cool. Art marketers, take note! After living in a new house for a while, did you ever decide that you wanted to rearrange the rooms to make better use of them? Something like that has happened on RobertsonWorkshops.com. After some valuable feedback from students, we’ve decided to change our classes to better fit how you want to learn. Starting now, you can begin any class immediately–no waiting for a class to begin! If you can buy it, you can watch it right now. What’s more, you have access to all the videos, class notes and community chat for six full months from your day of registration. Your instructor will answer questions online during the first seven days of every month, and you’ll be able to discuss your projects with other students in your class during the entire length of the class. All classes are under $50 and gift certificates are available for the perfect holiday present. New Source for Collage Elements? I recently received this wonderful note from a regular student in my online classes. Congratulations Jane! 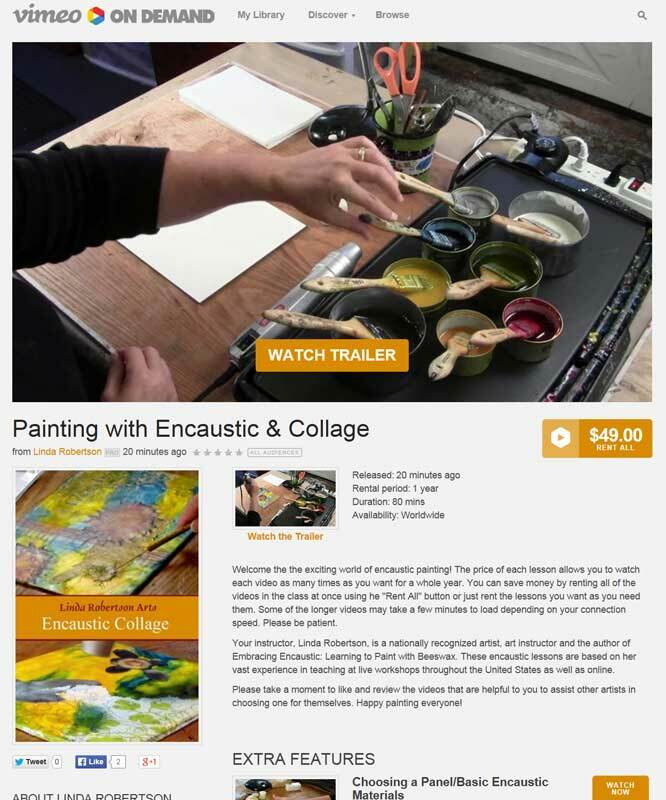 * The Great Undo is one of the lessons in my Encaustic Collage class which shows you how to quickly and easily remove parts of your encaustic painting that you don’t like. As you might imagine, it’s a VERY popular lesson.